This modem concept of presenting information has undoubtedly proven its worth. The previously available first edition volumes of the “Anatomy of Domestic Mammals” in the German language were already followed by a second, revised and extended edition in the 3rd year. It has therefore been deemed appropriate that a revised edition of such successful German publications should be issued in the English language. Also the efforts to support the future perspectives of an international harmonisation of veterinary education have found a global resonance. Consequently this book on “anatomy” has already been printed in Portuguese, Czech and Slovakian and now a translation into Spanish and Italian has also been begun with great vigour. 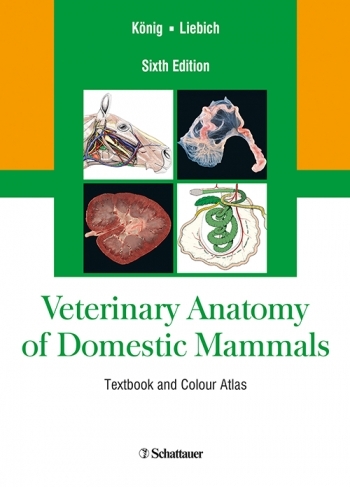 The participation of scientists from several European universities and veterinary faculties in the making of this textbook will be a further step in harmonising the education in the field of veterinary anatomy. Over the past centuries, the learning material in the field of veterinary anatomy has increased immeasurably. The in-depth comparative-anatomical material and subject-specific details in particular have made it near to impossible for students to differentiate between important and less important facts during their studies and in practice. Thus an important aim of this book is to aid student’s comprehension while learning and during private studying of anatomical facts. Considering the large scope of material covered, the publishers therefore deemed it necessary to print a compact illustration of the anatomical material, which would be sensibly and effectively summarized into one volume of “anatomy”. The basic concept of this “Veterinary Anatomy of Domes-tic Mammals” includes therefore in one volume the essential structural and functional facts on the locomotive apparatus, plus the internal organs of domestic animals, showing their close connection to the circulatory and the nervous system. Emphasis is also placed on the lymphatic and endocrine system, as well as the sensory organs, the skin and cutaneous appendages. In this way the facts are concentrated and by linking the content, a connection to the veterinary practice is undertaken. In so doing one avoided using detailed facts, in favour of a readable and illustratively presented text. The sensible supplementation of a large number of semi-schema-tic illustrations and colour photographs should also from a didactic perspective which contributes to enjoying the morphology.